We’ve had quite a few requests for overcoats over the last few months. 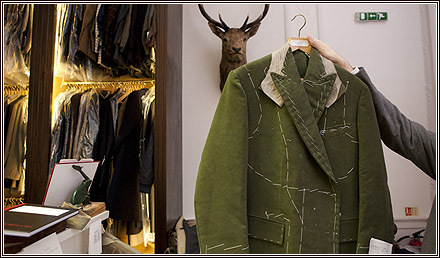 Often men leave it a little too late though – they don’t ask for the overcoat until they’re too cold not to have one, but it will be months before they can have one made bespoke. The key is to think of these things in the preceding season. Overcoats remain very popular. We’ve even had men that don’t buy suits from us, possibly don’t buy suits at all, commissioning a lovely navy overcoat to wear with jeans and a sweater. Like a good jacket, it will make a man look elegant no matter what else he is wearing with it. Men are often surprised what a difference a well-cut overcoat can make to their silhouette. They assume that because it has to go over other things it can’t have much shape. But there’s still a great opportunity to flatter a man. I’m sure there are many men today that wouldn’t think to come into a tailor like this because they don’t wear suits day to day. But they forget about the pleasure of a casual jacket, a tweed or a blazer perhaps, and of a good overcoat. Blue is by far the most popular, at least for the first overcoat. Men are naturally conservative and they tend to be even more with an overcoat. But that doesn’t mean you can’t have a little fun with it, picking out a big herringbone or adding velvet to the collar, just to give it even more character. And there are occasional customers who want something even more unusual, like the green moleskin in the picture. We had a couple of moleskin commissions over the winter. They can make a nice casual alternative to a wool or cashmere, because of the way the cotton breaks in.